Perth Mint proudly offers a distinctive design represented by one of 12 animals of the ancient Chinese lunar calendar. For 2019 we celebrate the twelfth animal in the 12-year cycle of the Chinese zodiac, the Year of the Pig. 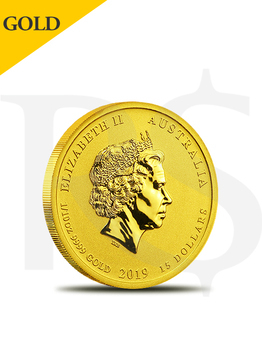 This delightful 2019 Gold 1/10 oz Australia Perth Lunar Pig coin will conclude the Lunar Series II. This will most certainly be a treasured and valuable addition as it completes your collection! 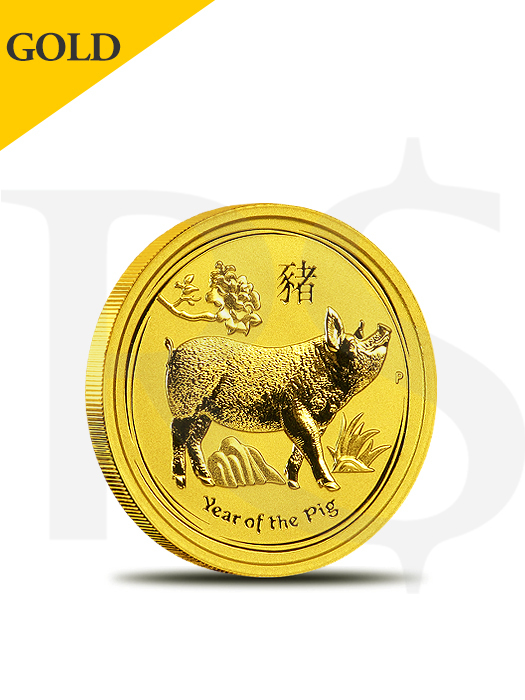 2019 Gold 1/10 oz Australia Perth Lunar Pig BU. Reverse: Features a truly delightful scene of a large domesticated pig, snout raised high, stepping along a group of rocks and a nicely-stylized plant. Above head an attractive leafy branch hangs with a beautiful pelony flower. Also included are the Chinese character for “pig,” the inscription “Year of the Pig” and The Perth Mint's traditional “P” mintmark.